Jeff Bezos, founder of the private spaceflight company Blue Origin, spoke at the 33rd annual Space Symposium. 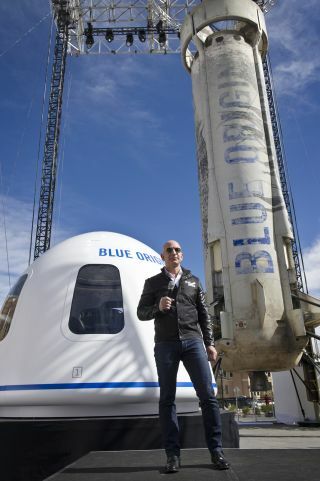 Behind Bezos are a spent New Shepard rocket booster and a replica of the New Shepard passenger capsule that the company plans to use for space tourism. COLORADO SPRINGS, Colo. — Jeff Bezos became a billionaire with his internet shopping company Amazon.com. That venture is still funding Bezos' private spaceflight company, Blue Origin, he said yesterday (April 5) here at the 33rd annual Space Symposium. "This isn't the future business model, but my business model right now for Blue Origin is, I sell about a billion dollars a year of Amazon stock, and I use it to invest in Blue Origin. So the business model for Blue Origin is very robust." "I think it's very important that Blue Origin stand on its own feet and be a profitable, sustainable enterprise," Bezos said. "That's how progress gets made. I do not want Blue Origin to be a not-for-profit." Blue Origin is now working on multiple ventures that could provide future revenue streams. The company is building an orbital rocket called New Glenn, which will utilize Blue Origin's BE-4 engines. The company has already presold six flights on New Glenn for two satellite provers. Blue Origin has also signed an agreement to sell the BE-4 engines to the commercial launch provider United Launch Alliance, which plans to use them in its next-generation rockets. But space tourism is a largely unexplored market, so there is very little indication of how many people will be willing to buy tickets for New Shepard rides. Blue Origin has not set a price for those trips yet, but Virgin Galactic, which is also working toward suborbital flights for private citizens, has set the cost at between $200,000 and $250,000. That price range severely limits the potential customer pool for both companies. "You can do research and surveys, and ask people if they want to go, but it's really hard to know," Bezos said. "We're really close to finding out what the customer demand will be, but I think nobody knows that for sure yet."